Wireless WLAN 802.11 ac/a/b/g/n, 2.4GHz and 5Ghz, Bluetooth 4.2. On board WLAN/BT antennas. Video Inside decoder: H.264 10bit up to HP level 5.1 - 2160p@60fps (4096x2304), VP9 - 2160p@60fps(4096x2304), H.265/HEVC 10bit - 2160p@60fps(4096x2304), MPEG-1, MPEG-2, MPEG-4, H.263, VP8, VC-1. A 96Boards compliant power supply (sold separately). A uSD card or eMMC module. A HDMI or DVI LCD Monitor that supports a resolution of 720p/1080P/4K. HDMI-HDMI cable or HDMI-DVI cable to connect the board to the Monitor. A computer keyboard with USB interface. A computer mouse with USB interface. Download the right image for ROCK960 model C, write the image to uSD card or eMMC module, install the uSD card or eMMC module on ROCK960 model C.
Connect the HDMI cable to the ROCK960 Board HDMI connector and to the LCD Monitor. Plug the power supply into the power outlet. The system will automatically boot when the power supply is connected. RK3399 is a low power, high performance processor for computing, personal mobile internet devices and digital multimedia devices; it integrates dual-core Cortex-A72 and quad-core Cortex-A53. RK3399 supports multi-format video decoders including H.264/H.265/VP9 up to 4Kx2K@60fps, especially, H.264/H.265 decoders support 10bits coding, and also supports H.264/MVC/VP8 encoders by 1080p@30fps, high-quality JPEG encoder/decoder, and special image preprocessor and postprocessor. RK3399 has high-performance dual channel external memory interface (2x32bit LPDDR3) capable of sustaining demanding memory bandwidths. Learn more at RK3399 Product Page. The PMIC on ROCK960 is RK808-D, a companion PMIC for RK3399 by Rockchip. The RK808-D is a complete power supply solution for portable systems. The highly integrated device includes four buck DC-DC converters, three high performance ldos, I2C interface, programmable power sequencing and an RTC. The RK808-D integrates internal RC oscillator for low cost application which without RTC function. The ROCK960 Board provides 1GB(model C1) or 2GB(model C2) or 4GB(model C4) LPDDR4-SDRAM which is a 2-channel and 32bit width bus implementation interfacing directly to the RK3399 build-in LPDDR controller. The maximum DDR clock is 800MHz. It’s soldered on board and not replaceable. The ROCK960 Board doesn’t provide any on board storage, it reserve a eMMC socket for flexible storage options. The eMMC socket uses two B2B connector to mount the eMMC module, the connector model is GB042 Series, one connector(34pin) for eMMC signal, the other(30pin) is for mount purpose only. The ROCK960 Board SD slot signals are routed directly to the RK3399 SDIO interface. It meets the SD3.0 standard. The ROCK960 Board can boot up from the EMMC or the Micro SD card. If a bootable Micro SD card is inserted, ROCK960 will boot from Micro SD card and ignore the EMMC. If the Micro SD card is not inserted or non-bootable(ie. as storage media). The ROCK960 will try to boot from EMMC. If there is no bootable image in EMMC, the board will go to Maskrom mode and wait for USB command from host. The wifi/bt module used on ROCK960 model C is AP6255 from AMPAK Technology. The AP6255 module complies with IEEE 802.11 a/b/g/n/ac standard and it can achieve up to a speed of 433.3Mbps in 802.11n to connect the wireless LAN. Single-stream spatial multiplexing up to 433.3 Mbps data rate. Supports standard SDIO v3.0 and backward compatible with SDIO v2.0 host interfaces. The ROCK960 Board also has a RF connector to connect the external antenna or other RF device. If you want to use this function, you should change the 0ohm resistor directions besides the antenna. Supports Bluetooth V4.2+EDR with integrated PA for Class 1.5 and Low Energy (BLE). Concurrent Bluetooth, and WLAN operation. Simultaneous BT/WLAN receive with single antenna. RK3399 support HDMI 1.4 and 2.0, up to 10-bit depth color mode, up to 1080p at 120Hz and 4Kx2K at 60Hz HDTV display resolutions and up to QXGA graphic display resolutions. The 96Boards specification calls for a MIPI-DSI implementation via the High Speed Expansion Connector. 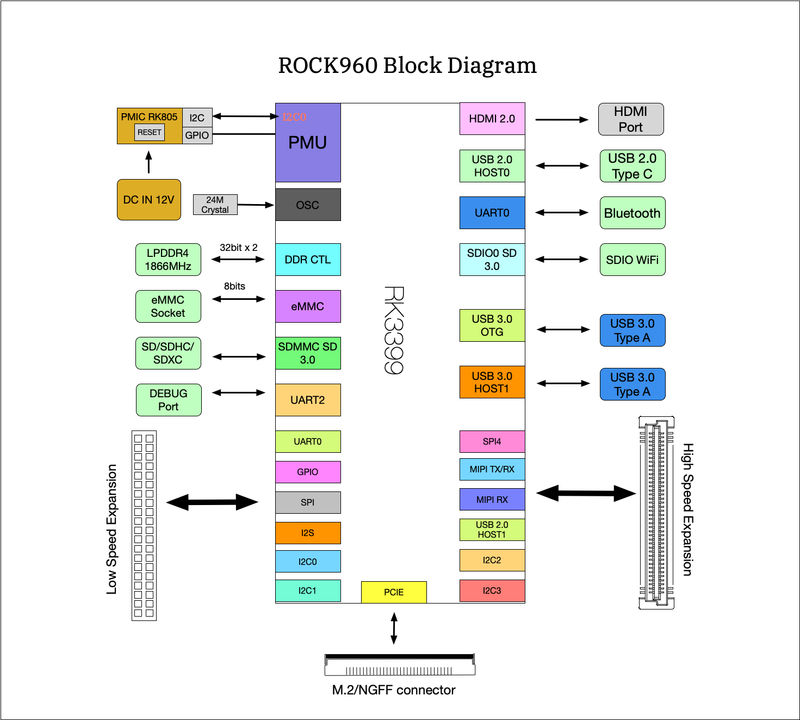 The ROCK960 Board implements a 4-lane MIPI_DSI interface meeting this requirement. It can support up to FHD(1080p@60fps). The ROCK960 Board routes the MIPI_DSI interface signals to the MIPI_TX interface of the RK3399. The 96Boards specification calls for two camera interfaces. The ROCK960 Board supports two camera interfaces, one with a 4-lane MIPI_CSI interface and one with 2-lane MIPI_CSI interface, meeting this requirement. 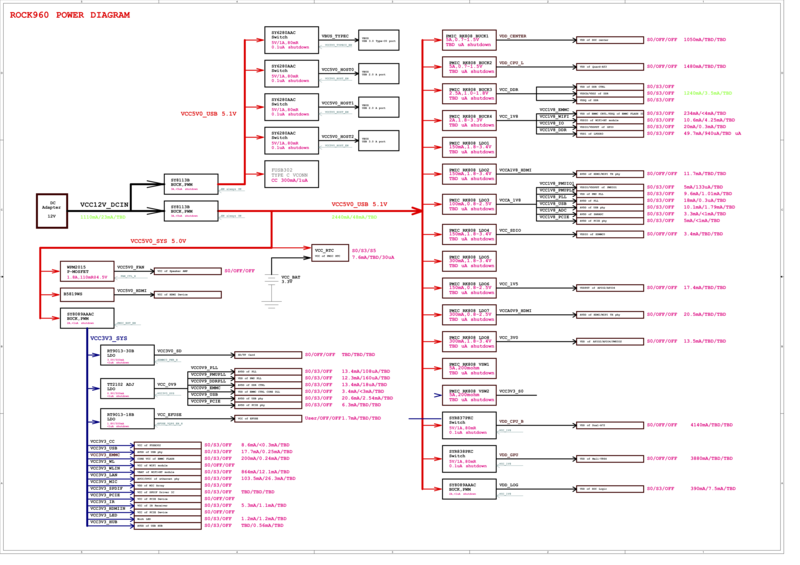 The 4-lane MIPI_CSI interface routes to MIPI_TX/RX of RK3399, it can also be configured as MIPI_DSI. The USB 3.0 OTG can work in device mode or host mode. There is an on board switch to switch the OTG as Host or device mode. In maskrom mode, the OTG is forced in device mode. When USB 3.0 OTG in device mode, you need a USB A-to-A cable connects to PC or host computer. The ROCK960 Board has two audio ports: HDMI, I2S. There is a 0ohm resistor(part number R2009) on board for the whole system power, to measure the power, you need to remove it. The 96Boards specification calls for support for an external fan. That can be achieved by using the 5V or the SYS_DCIN (12V), both present on the Low Speed Expansion connector. The ROCK960 Board has three UART ports, two(UART3 and UART4) present on the Low Speed Expansion connector and one(UART2) has a dedicated 3 pin header. UART 2 is the default debug console and the default baud rate is 1.5Mbps. Check the serial console debug for how to setup on PC. The ROCK960 Board presents three buttons. They are Reset key, Maskrom key and Loader key. The RESET signals are also routed to the Low Speed Expansion connector. The button serves as the hardware reset button. short press and release the button,the system will be rebooted. The Maskrom Button is for firmware flash/upgrade. The loader Button is for bootloader to jump to recovery mode is pressed at boot time. ROCK960 Board has six LEDs. WiFi activity LED –The ROCK960 Board drives this Yellow LED via GPIO4_D5(GPIO number 1157), an IO from RK3399. BT activity LED –The ROCK960 Board drives this Blue LED via GPIO4_D6(GPIO number 1158), an IO from RK3399. The ROCK960 has an additional M.2 connector, which expose the 4 lanes PCIE 2.1 signal from RK3399, a M.2 SSD can be connected to add more storage. The Low Speed Expansion Connector implements as following on ROCK960. Note: the GPIO in bold means it’s different from ROCK960 model A/B. 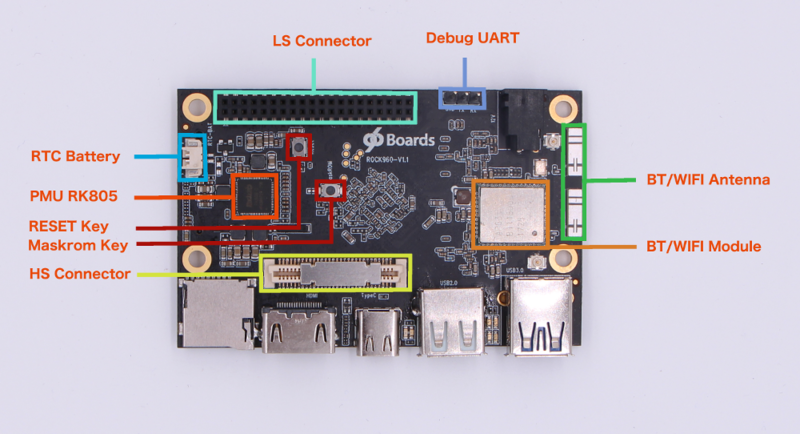 The 96Boards specifications calls for a 4-wire UART implementation, UART0 and an optimal second 2-wire UART, UART1 on the Low Speed Expansion Connector. The ROCK960 Board implements UART0 as a 4-wire UART that connects directly to the RK3399 SoC. These signals are driven at 1.8V. The ROCK960 Board implements UART1 as a 2-wire UART that connects directly to the RK3399 SoC. These signals are driven at 1.8V. The 96Boards specification calls for two I2C interfaces to be implemented on the Low Speed Expansion Connector. The ROCK960 Board implements both interfaces named I2C1 and I2C6. They connect directly to the RK3399 SoC. 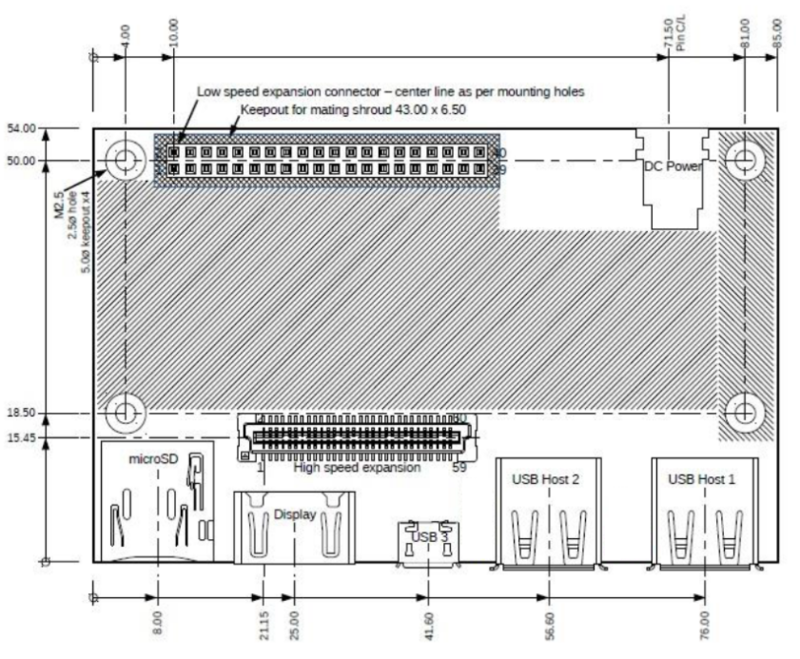 The 96Boards specification calls for one SPI bus master to be provided on the Low Speed Expansion Connector. The ROCK960 Board implements a full SPI master with 4 wires, CLK, CS, MOSI and MISO. The signals are connected directly to the RK3399 SoC and driven at 1.8V. The 96Boards specification calls for one PCM/I2S bus to be provided on the Low Speed Expansion Connector. The CLK, FS and DO signals are required while the DI is optional. The ROCK960 Board implements a PCM/I2S interface with 4 wires, CLK, FS, DO and DI. The signals are connected directly to the RK3399 SoC and driven at 1.8V. The 96Boards specification calls for a signal on the Low Speed Expansion Connector that can power on/off the board and a signal that serves as a board reset signal. The ROCK960 Board routes the PWR_BTN_N (named PMIC_PWRON on schematic) signal to the PWRON pin of the PMIC RK805. A mezzanine implementation of this signals should not drive it with any voltage, the only allowed operation is to force it to GND to start the board from a sleep mode. The ROCK960 Board routes the RST_BTN_N (named RESET_L on schematic) signal to the NRESPWRON pin of the PMIC RK805. This signal is also routes to SW2100, a push button for reset. +5V Provide a minimum of 5W of power (1A). SYS_DCIN 8-18V input with enough current to support all the board functions or the output DCIN from on-board DC Connector able to provide a minimum of 7W of power. +1.8V Driven by PMIC RK805 up to 2500mA. It is the system main 1.8V power (VCC_1V8), and it can supply power up to 200mA to the Low Speed Expansion Connector. +5V Driven by a 3A pwm buck converter (SY8113B). It also provides the VBUS power to the two USB host connectors and the HDMI 5V power to the HDMI connector. The remaining capacity provides a max current of 2A to the Low Speed Expansion Connector, for a total of 10W which meets the 96Boards requirements. SYS_DCIN Can serves as the board’s main power source or can receive power from the board. The 96Boards specification calls for a MIPI-DSI to be present on the High Speed Expansion Connector. A minimum of one lane is required and up to four lanes can be accommodated on the connector. The ROCK960 Board implementation supports a full four lane (1.2Gbps/lane) MIPI-DSI interface that is routed to the High Speed Expansion Connector. The MIPI-DSI signals are directly connected to MIPI TX/RX of RK3399. The 96Boards specification calls for two MIPI-CSI interfaces to be present on the High Speed Expansion Connector. Both interfaces are optional. CSI0 interface can be up to four lanes while CSI1 is up to two lanes. The ROCK960 Board implementation supports a full four lane MIPI-CSI interface on CSI0 and two lanes of MIPI-CSI on CSI1. All MIPI-CSI signals are routed directly to/from the RK3399 SoC. CSI0 can support up to 13M@30fps and CSI1 can support up to 8M@30fps. The max data rate of each lane is 2.5Gbps. The 96Boards specification calls for two I2C interfaces to be present on the High Speed Expansion Connector. Both interfaces are optional unless a MIPI-CSI interface has been implemented. Then an I2C interface shall be implemented. The ROCK960 Board implementation supports two MIPI-CSI interfaces and therefore must support two I2C interfaces. For MIPI-CSI0 the companion I2C2 is routed directly from the RK3399 SoC. For MIPI-CSI1, the companion I2C is I2C3. Each of the I2C line’s pull up can be set from RK3399 internally. The 96Boards specification calls for an SD interface or a SPI port to be part of the High Speed Expansion Connector. The ROCK960 Board implements a full SPI master with 4 wires (96Boards SPI Configuration), CLK, CS, MOSI and MISO. All the signals are connected directly to the RK3399 SoC. These signals are driven at 1.8V. The 96Boards specification calls for one or two programmable clock interfaces to be provided on the High Speed Expansion Connector. These clocks may have a secondary function of being CSI0_MCLK and CSI1_MCLK. If these clocks can’t be supported by the SoC than an alternative GPIO or No-Connect is allowed by the specifications. The ROCK960 Board implements two CSI clocks which are connected directly to the RK3399 SoC. These signals are driven at 1.8V. The 96Boards specification calls for a USB Data line interface to be present on the High Speed Expansion Connector. The ROCK960 Board implements this requirement by routing USB HOST1 of RK3399 to the High Speed Expansion Connector. The 96Boards specification calls for an optional MIPI-HSIC interface to be present on the High Speed Expansion Connector. The ROCK960 Board implementation doesn’t support this optional requirement. The pin 60 of the High Speed Expansion Connector is pulled up to VIO18_PMU via 100K resistor. 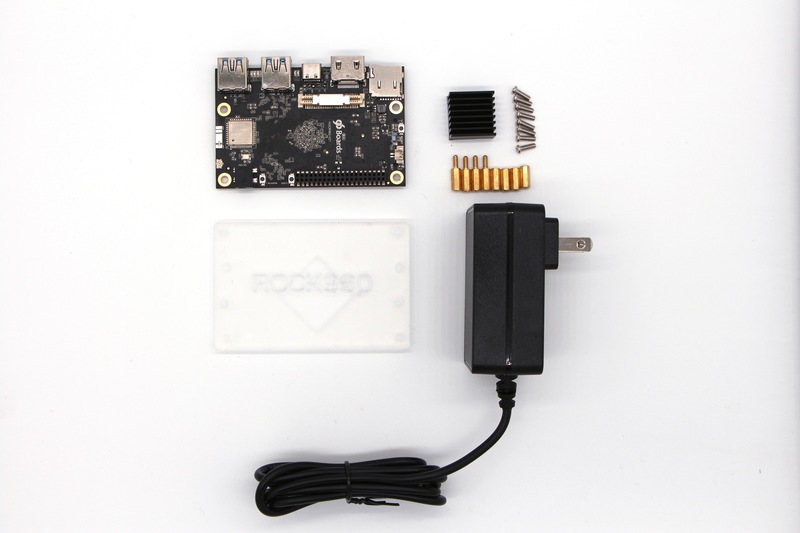 ROCK960 board also exports a M.2 PCIE M key socket, which connects directly to the SoC. The M.2. socket supports M.2 M key or B&M key PCIE SSD. An 8V to 18V power from a dedicated DC jack. An 8V to 18V power from the SYS_DCIN pins on the Low Speed Expansion Connector. 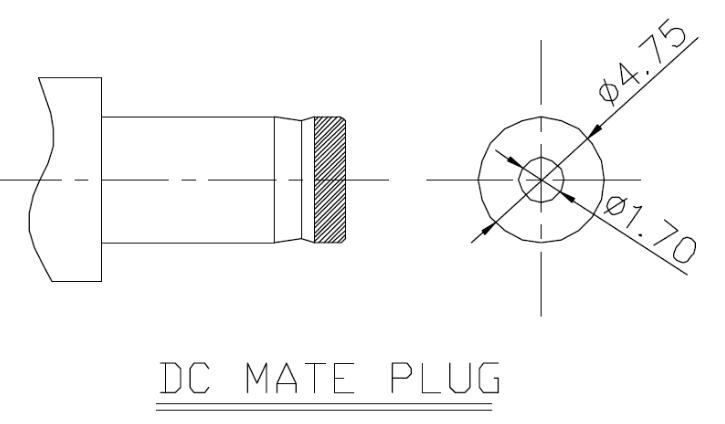 Note: Please refer to the mechanical size of the DC plug below.The inside diameter of the plug is 1.7mm，the outer diameter of the plug is 4.75mm.The positive electrode of the DC plug is in the inside, and the negative pole is outside. The user of the ROCK960 Board should never apply power to the board from DC jack and the Low Speed Expansion connector at the same time. There is no active or passive mechanism on the ROCK960 Board to prioritize one source over the other.